Kenya and Ethiopia have signed a UN-backed trade deal worth $200m (£130m) in a bid to ease cross-border conflict. 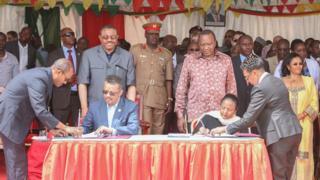 President Uhuru Kenyatta and Prime Minister Hailemariam Desalegn agreed the deal in the border town of Moyale. The deal aims to tackle youth unemployment by creating jobs in the energy, mining and livestock industries. Tensions between rival ethnic groups have risen due to lack of land and water. There was a heavy security presence ahead of the meeting on the Kenya-Ethiopia border. "This is a historic function," Kenya's President Kenyatta was quoted as saying. He said a tarmac road would be built by September 2016, linking the two countries' capital cities. Cross-border raids have forced thousands to flee their homes in recent years.